Noteworthy Occasions carries a tremendous selection of personalized stationery products. In order to provide you with the most up-to-date product selection and current discounts offered by our vendors, we provide online websites dedicated to the specific lines we represent. Please click on any of the brands below to see our complete selection of products. Embossed Graphics Stationery offers personalized stationery, including flat and folded note cards, starting at just $19.95 for 50 cards. Embossed Graphics Stationery is known for their clean, simple designs with high-quality thick paper, giving a lot of bang for the buck. Embossed Graphics also carries a wide variety of printed note pads, memo cubes, desk slabs, personalized napkins, family note cards and notepads. Embossed Graphics has frequent discounts with a rotating monthly deal. 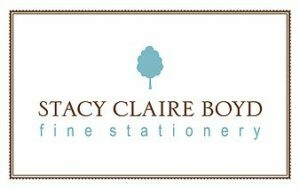 If you are looking for monogrammed stationery or masculine designs, then you will definitely want to check out this line. We offer all of the current discounts on Embossed Graphics Stationery with monthly savings from 20-50% on best-selling items. Our PrintsWell Stationery site includes 15 different designers under one roof, so to speak. You can visit our PrintsWell Site or click on the specific designers below to see their products. PrintsWell is a Noteworthy Occasions favorite for personalized stationery that is fun and colorful with a wide-variety of designs suitable for anyone. You will love browsing through the note cards, calling cards, gift enclosures, bag tags, personalized notepads, party and wedding invitations, holiday photo cards and more. Check out our site for the most up-to-date discounts. VIEW ALL THESE BRANDS on our PrintsWell site. An industry leader in wedding invitations, holiday cards and Bar and Bat Mitzvah invitations. Birchcraft Studios provides an excellent turnaround time for orders under a tight deadline. We carry the entire line of Three Designing Women products. Please view the products on the TDW site and call or e-mail for assistance with your order. We carry the entire line of PSA Essentials Personalized Stamps. Please view the products on the PSA Essentials site and call or e-mail for assistance with your order. We are currently offering PSA Essentials Stamps for only $30, a 25% discount.